How do sniffer dogs help find bodies? How do doctors know that someone was murdered? And how do scientists identify the killer? Part of the What’s Cool About Science? series from Lerner’s Searchlight Imprint, Discover Forensic Science introduces kids to the fascinating world of fact-based crime fighting. 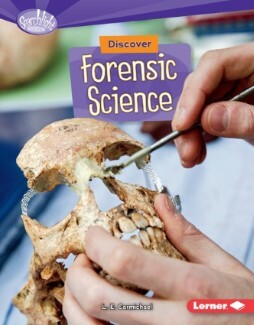 Discover the power of forensic science, and get a sneak peak at the forensics of the future, with this book for grades 3-5. This my third book about forensic science, but the first for kids in elementary school. Writing about DNA fingerprinting for kids this young was challenging, but a lot of fun. Most kids don’t learn about DNA until grade 8 or 9! I got to choose which types of forensic science I wanted to include in the book. I figured this was a great excuse to combine two of my favourite topics – mysteries and dogs! Learning more about crime-fighting canines was great fun, and I hope kids love what I discovered.